Renault Samsung Motors CEO Dominique Signora said Wednesday the company will continue investing in the Korean market, considering the Korean unit’s significance to its French parent company. 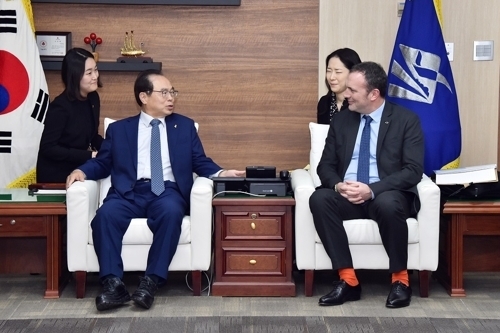 During a closed-door meeting with Busan Metropolitan City Mayor Oh Keo-don, Signora asked for joint efforts to solve a prolonged labor dispute and to revitalize the city’s export competitiveness through the automaker’s only plant in Busan. Signora also stressed that Renault Samsung Motors’ Busan plant is “a core asset for the company” to remain competitive in the domestic market, the company said in a statement. Renault Samsung Motors plays a strategically important role for its parent company, Renault Group, in terms of development and sales of D-segment vehicles, he added. Citing the launch of the new SUV XM3 Inspire slated for next year as an example of Renault Samsung’s continued effort to invest in the Korean market, Signora said it will create more jobs, increase export volume and contribute to revitalizing the local economy by manufacturing the electric vehicle Twizy. The company plans to produce the Twizy at its Busan plant from September. He also highlighted the urgent need to end the dispute with a labor union over wages, to stabilize production volume for overseas shipments. Renault Samsung said last week that it would halt operations at the Busan plant from April 29 through May 3 due to continued friction with the union in wage negotiations, which have stalled for six months. About 65 percent of the Busan plant’s total production are for overseas shipments. The company has maintained its stance to keep a fixed production amount for export models, while the union has argued for an increase in wages with less labor intensity. In the first quarter of this year, the carmaker sold a total of 39,210 cars. The number has fallen below 40,000 for the first time since September 2014, when the carmaker began manufacturing the Nissan Rogue at its Busan plant on a manufacturing contract.